What winter are you experiencing where you live this week? Down here in Georgia, we are in DOGWOOD WINTER. Since we're generally about two weeks ahead of my hometown of Harlan, Kentucky, you may be anxious for DOGWOOD WINTER to arrive. We have several winters in the south. They always help us gauge when it's safe to plant. If you plant before the biggest winter cold snap passes, you will probably have wasted your seeds--and your back. So, why is it called DOGWOOD WINTER? That's fairly easy to figure out. After the cold snap, the dogwood begins to bloom. We have a week or so of warmer weather before the next winter arrives. So, if the dogwoods are blooming, you have completed DOGWOOD WINTER. DOGWOOD WINTER isn't the last winter, but it's the one I always looked forward to each spring. 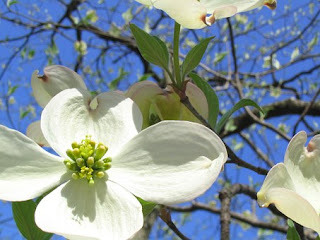 One of my favorite events took place down in Knoxville, Tennessee every spring--the Dogwood Arts Festival. You could drive through the streets and "ooh" and "aah" as your family enjoyed the gorgeous display of white and pink dogwoods in full bloom. The communities celebrated by having arts and crafts, food, and all types of entertainment. After a long winter, DOGWOOD WINTER gave everyone hope for the coming summer. 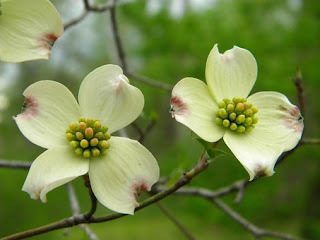 The common story about DOGWOOD is that the bloom represents the crucifixion of Christ. The four petals represent the cross. The brown edges are the blood He shed. The yellow center stands for His crown. Usually, it works out that the DOGWOOD is in full bloom right around Easter. I hope you have DOGWOOD WINTER soon wherever you live. It certainly puts a smile on my face. Do you have a story about DOGWOOD WINTER? If you grew up in my era and were prone to cuts and scrapes, I'm sure you remember the Appalachian Word of the Week -- MERTHIOLATE. MERTHIOLATE, not to be confused with the milder mercurochrome, made more children cry than skinned knees, falls from monkey bars, and sliding down an icy street in winter on your nose. Just the memory of having MERTHIOLATE painted on your cuts and scrapes can make your heart race with terror. I screamed much louder as Mom or my teacher approached me with that tiny bottle of glowing pinkish colored torture than I ever cried in pain from the injury. Unfortunately, I fell a lot as a child. It didn't help that our playground at Loyall was covered with gravel or concrete. Every fall resulted in bloody open wounds. 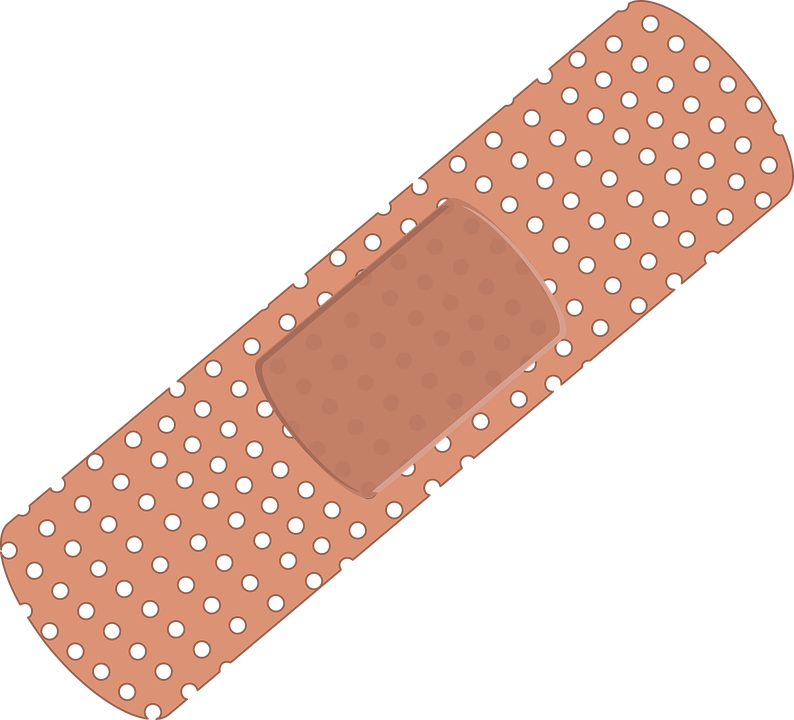 No matter how intensely I begged, pleaded, and cried for them to paint my wound with the basically painless mercurochrome instead, they always grabbed the MERTHIOLATE out of the first aid box and came at me with that glass applicator after dipping it into the toxic glowing liquid. At one point, after enduring a week of multiple doctorings of MERTHIOLATE, I remember deciding it was better to bleed and risk disease than to have one more treatment. I hid from the teacher. Unfortunately, one of my "friends" ratted on me and the teacher came trotting to my hiding place with that tiny bottle. I still don't forgive that "friend." One of the happiest times in my life was when I reached the age when I didn't come in from recess bleeding. Of course, it could be a result of growing out of my extreme awkwardness. Did you have to endure the pink stain of torture being slathered on your cuts and abrasions? This week I’m going to talk about one of the nasty and painful critters that left its mark on me way too many times during my childhood. WASPERS. WASPERS are not to be confused with honey bees, yeller jackets, bumbly bees, hornets, or mud daubers. These rascals build their paper-thin nests almost anywhere and can get quite testy if they're disturbed. I learned it the hard way one summer when I attempted to replace a broken croquet mallet stick with a different one. The mallet was stuck tight and refused to unscrew. 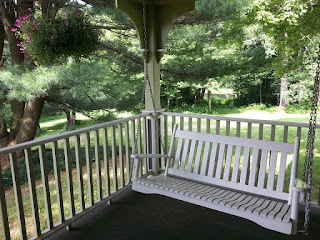 I got this great idea to use the side of the coal house to knock it loose. To set this up, I had my hair in dog ears. Dog ears are like pigtails, but not braided. That means I had a part (or bare scalp) in the middle and hair pulled up into my dog ears on each side. At about eleven years of age, my thought process had not fully developed when I started whacking that stick on the coal house. Before I knew what was happening, the entire nest of WASPERS swarmed me and commenced to stinging. They got me down the part between my dog ears, on my bare arms, and on my face. I commenced to screaming bloody murder for my mom. She looked out the back door at me jumping around and screaming to high heaven and grabbed the fly swatter. She didn’t use it to swat the WASPERS away from me. She used it to swat them ON ME! She swatted me so hard, I swear she hurt more than the WASPERS. She wouldn’t let me go into the house, either, until every one of them WASPERS was dead or gone. 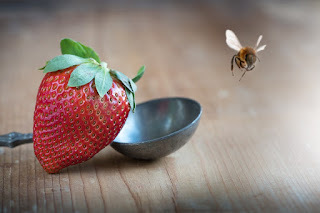 I swelled up like a red strawberry. Mom had to pick out the stingers left behind when she walloped the WASPS right off their back ends. I hurt from the part in my hair to my ankles. One great big one got me in the fleshy part under my arm and wouldn't let go. I still have the shadow of a scar from that rascal. That night I had to soak in a tub of cool water with baking soda, trying to get rid of the venom. 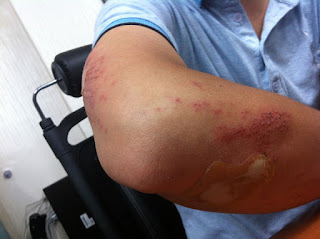 It took several days for the pain to turn to itching. I also kept my hair in those dog ears until my scalp healed enough to brush my hair again. Nope, WASPERS are not a happy memory of my childhood. I learned a valuable lesson, though. 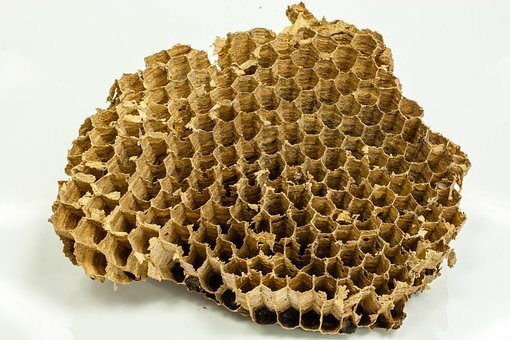 Don’t whack on anything that might house a WASPERS nest inside. They have a nasty disposition. 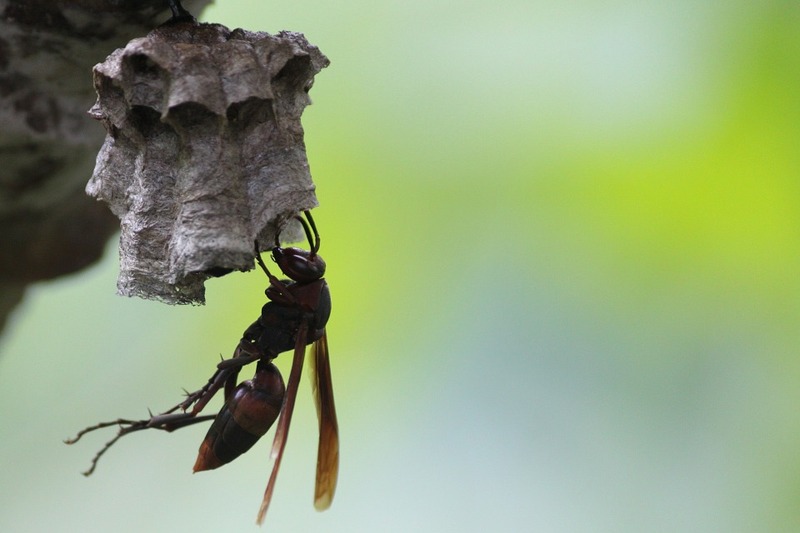 Did you get stung by WASPERS when you were young? Do you still remember the pain? I start to drool when I think about this week’s Word of the Week. ‘MATERS were an important part of our diet when I grew up. 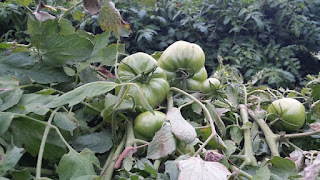 Nothing could compete with going out to the garden in summer and picking a big, red ‘MATER off the vine and eating it right then and there, warmed by the summer’s sun. The juice dripped down your chin and ran from your hand to your elbow. But we didn’t care. That ‘MATER was a small taste of heaven. If we had a tad of patience, we’d wait until we got the salt shaker. But, a good ole ripe ‘MATER didn’t need salt. Some ‘MATERS didn’t make it in the garden long enough to turn red. We picked ‘em while they were still green, sliced ‘em up, rolled them in a mixture of flour and meal, and fried them up in our iron skillet. The fragrance of a frying green ‘MATER was enough to drive you crazy while you waited. I admit, some of my ‘MATERS never make it to a supper dish. ‘MATERS were sometimes about all we had to eat. 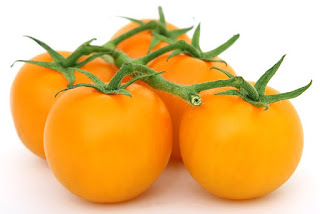 Many a time, I had a ‘MATER sandwich, with mayo, on white Bunny bread for my lunch. But, if we were living high on the hog, there was nothing like adding a slice of fried baloney to that sandwich. Or, maybe a hamburger patty for supper time. Daddy also grew yellow ‘MATERS in our garden. They had a sweet, mellow flavor that I enjoyed eating by themselves, with a sprinkling of salt on top. Unfortunately, ‘MATERS don’t grow in the winter in Appalachia. But, our ancestors figured out a solution for that problem. They canned them. 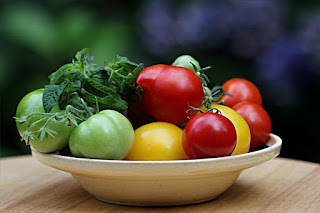 You couldn’t eat them sliced or fresh from the plant, but those jars of gorgeous red ‘MATERS were always available to pop the lid and add to your supper spread. We ate them heated up, all by themselves, with a touch of salt and pepper. Or, if we were lucky, Mom added them to our macaroni and cheese. 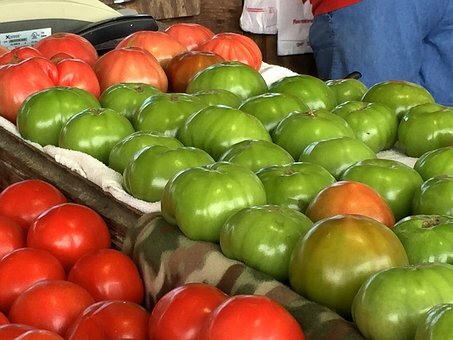 ‘MATERS you get from the grocery store can’t compare to a sun-kissed ‘MATER grown in your own backyard, in the rich black soil of Appalachia. If you’ve never had one, I hope you get to have the pleasure before you die. Surely, God will have ‘MATERS growing in heaven for us. That’s another incentive for accepting Christ as your Savior so you can enjoy all the glorious pleasures God created for us. If you grew up Appalachian, you got to experience a few more of those heavenly pleasures on earth than most other folks. 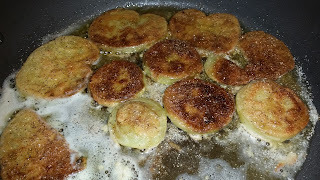 Now, I think I’m going to fry up some green ‘MATERS for lunch. 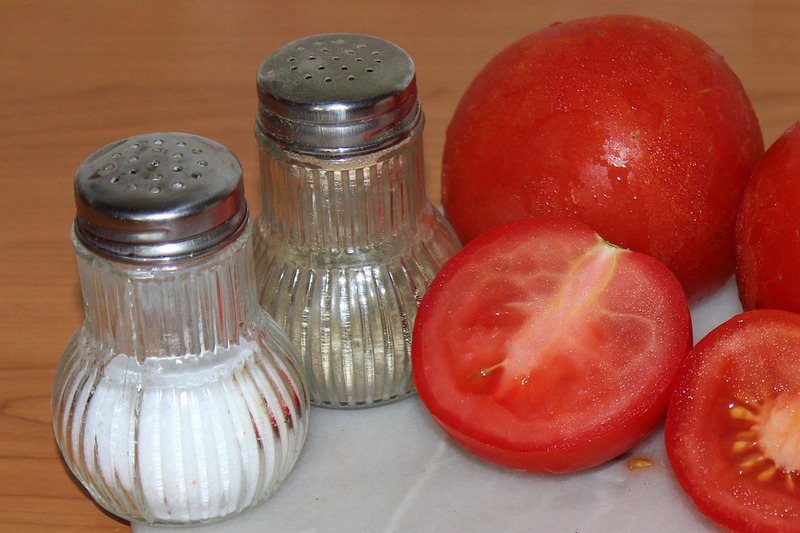 How do you like your ‘MATERS best? Have any special memories of eating ‘MATERS? Share them with us. 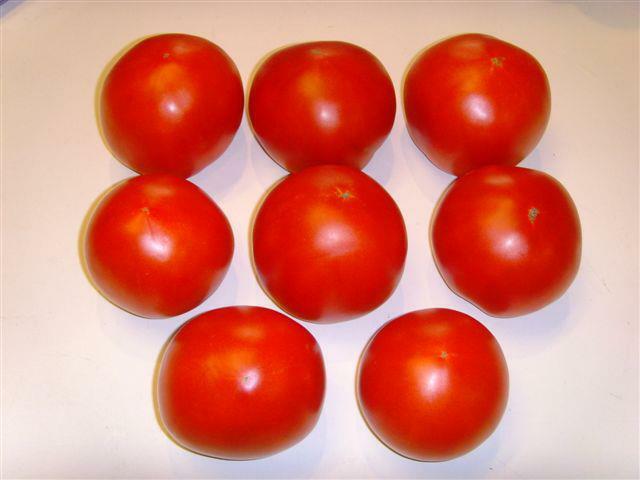 Here's a few more photos of 'MATERS to make you drool. 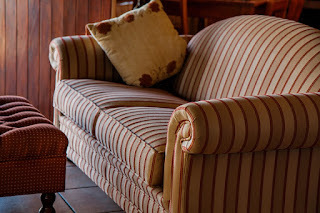 Last week we talked about the divan (sofa, couch). This week we learn what often happened on the old family divan – SPARKIN’. A lot of SPARKIN’ goes on in Appalachia. It usually starts in the early teens. In my day, most of the SPARKIN’ took place right on the divan. 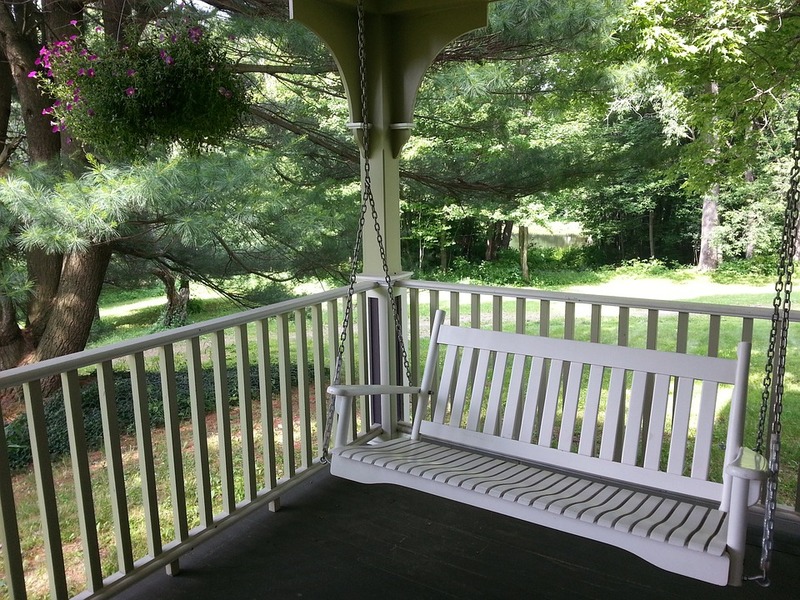 Or the front porch swing. Parents preferred keeping all the SPARKIN’ within eyesight of an adult. It’s the Appalachian term for dating. There was nothing as awkward as sitting with your “date” and surrounded by family members. I recall not much was said by the couple in the early stages. What does a boy say to a girl when her daddy or mama is sitting right there and there’s a shotgun leaning up against the wall? In the mountains, there wasn’t much going on to take your date outside the girl’s home. An occasional dance, a ballgame, or a family movie at the theater (saved for much later in the process, since they’d be together in the dark) didn’t provide many opportunities and cost money. The couple either got over the awkward stage or decided it wasn’t worth it and moved on to somebody else. 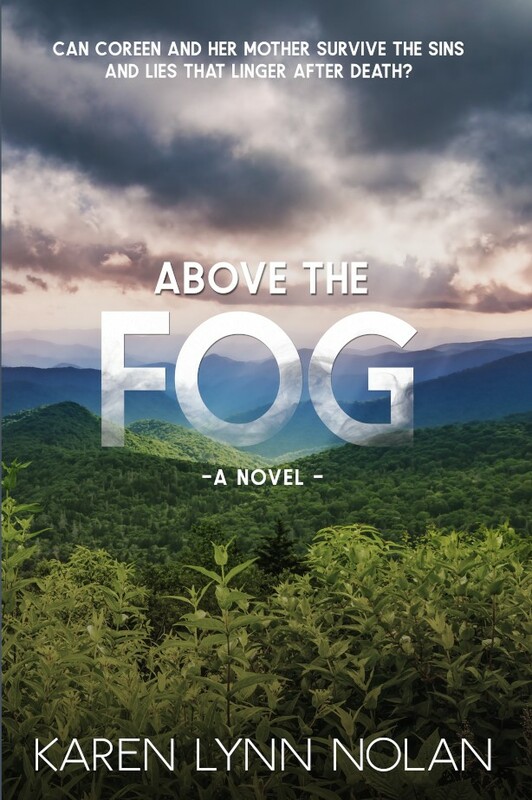 However, if the attraction was strong enough and the boy and girl persevered, they usually managed to take their SPARKIN’ out of sight of the family (remember, family in Appalachia includes every inhabitant of the hollers and mountainsides). If you get caught SPARKIN’ by anybody in the county, your mama will know before you get home. Heaven forbid if that SPARKIN’ includes touching or kissing. SPARKIN’ is a necessary inconvenience and weeds out a lot of undesirable couplings. After all, you marry the family, not just the boy or girl. So, you’d better be on good terms. By the way, SPARKIN’ isn’t limited to the young’uns. There’s still some SPARKIN’ going on until death comes a-knockin’. My mom used to tell me stories about the old folks in her Highrise Apartment building and the Senior Center. The SPARKIN’ part was still alive and well. 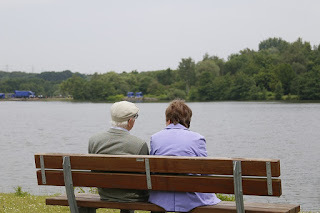 However, she told me from her own experiences, that life is too short to waste too much time sitting around being uncomfortable with a man who bored her closer to death than she was ready for. The pickins are even slimmer when you’re older, too. They would either up and die on her or she couldn’t handle their toothless grins or their inability to drive her to the next biggest town for lunch and some shopping. So, did you go SPARKIN’ when you were young? Do you have a funny story? Do you find yourself in your old age SPARKIN’ again? Is it any more fun than it was when you were young?